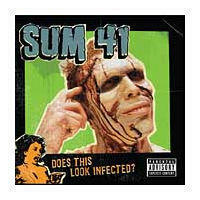 Sum 41 has impressed me, blowing away the competition. New, aggressive sound to Sum 41. Bonus DVD and live EP. No Pain for Pleasure songs on the actual album. Who would've thought that Sum 41, the band you love to hate, would release the major label punk album of the year (excluding Drive Thru of course)? Especially after releasing such a mediocre second album. Sum 41 has impressed me with what they've put together. Gone is the cheesy pop punk/hip hop that filled "All Killer No Filler", replaced by something new and fresh...for Sum 41 at least. The majority of the songs on "Does This Look Infected?" are aggressive punk numbers such as "No Brains", which sounds like something you would hear from P.O.D. The tempo soon picks up and another soaring guitar solo saves the song. Sum 41 still plays the pop punk that everyone loved about the first two records on "All Messed Up" and "My Direction", a song that deals with teenage suicide. I would not label this record pop punk at all, as Sum 41 tears it up on tracks like "Mr. Amsterdam", an overly impressive song mixing metalcore breakdowns with Maiden style riffs. Very impressive, especially for this "pop punk" band. "Thanks for Nothing" is a track that mixes both old and new Sum 41 styles. The pop punk/hip hop combination returns, this time greeted with some metal core breakdowns, an interesting combination. The band takes on So Cal technical punk on tracks like "Over My Head (Better Off Dead)" and "Hyper-Insomnia-Para-Condrioid", two tracks of pure aggressive melodic punk. "Billy Spleen" is a track that rips with its pseudo-metalcore intro and the record closes with "Hooch", a standard heavy rocker. "Does This Look Infected?" is loaded with run and gun, Maiden style guitar solos, aggressive vocals that are on the verge of metalcore in certain spots, yet retain the trademark Sum 41 sound. Sum 41 has set the stage for mainstream punk rock records with something new and original, full of aggressive tracks that aren't about girls. As a bonus, buyers of the album will be blessed with a bonus DVD with over 50 minutes of material, including 4 home videos, as well as two new songs from Pain for Pleasure (Sum 41's alter-ego). I am very impressed.